It’s always important to do your research, and take all the proper precautions before you get started, to avoid extensive damage to your wall, your TV, and your personal safety. Don’t risk a disaster - learn how to install a TV without damaging the wall in this simple, step-by-step guide. Before you decide to mount your TV, it’s important to note the weight of your TV itself, as well as how much weight your walls, and the TV bracket you use with installation, can bear. Some TVs can weigh 100 pounds or more, and if you don’t locate a stud on your desired wall that can support that weight, your TV could end up falling down. You’ll need to find a wall and a TV bracket that will support your TV’s full weight. You should decide right away where you’d like the TV mounted on the wall (i.e. centered, in a corner, etc.). Typically, the TV should be at your eye level, so also think about from what point in the room you’ll be watching, such as your couch or bed. It’s also important to consider what type of wall you’ll be dealing with before you get started. Brick and cement walls tend to be the most sturdy, but they can also be the most challenging to install a TV on. As noted above, you’ll need to select a TV bracket before you get started with install. The bracket is an apparatus that attaches to both the TV and the wall, keeping your TV secure and in place. 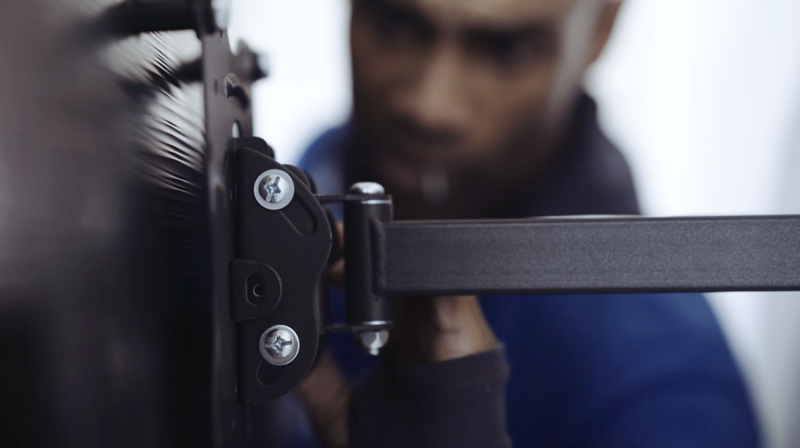 You’ll need to make sure that the bracket will for your TV, and be able to support its full weight - you can check its box and specifications for full details on this. The most popular bracket styles are fixed, tilting, full motion, and corner TV mounts, and to help you select one, check out our in-depth blog post on which type of TV mount to use. After you’ve selected a bracket, it’s time to measure your TV, and your TV bracket itself, so you can make a plan regarding where to mount it and where it’ll fit adequately on the wall. Next, we’d recommend laying down tape where you plan to mount the TV, as a visual guideline to stick to. This should help you stay on target, and place your TV exactly where you want it. You can also use a leveler when laying the tape down, to ensure that it’ll be nice and even when it’s installed. 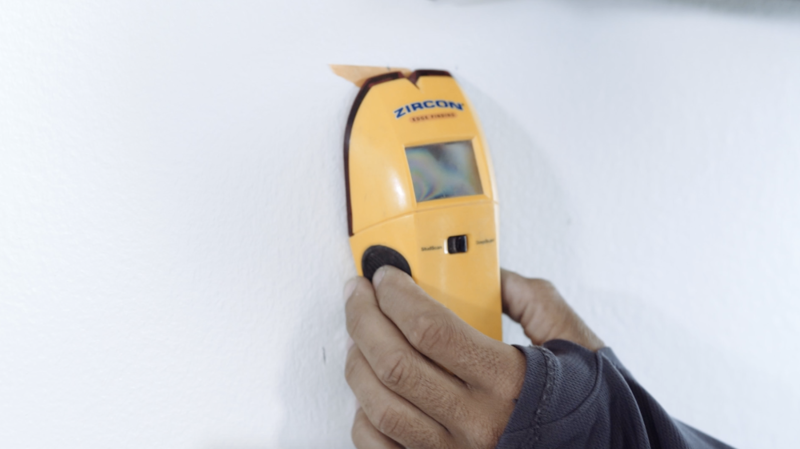 Now it’s time to break out that stud finder, the tool you’ll use to locate the stud behind the wall. The stud is a sturdy part inside the wall that you’ll attach the TV bracket to, it will support your TV best and will prevent any damage to the wall or your TV itself. If you don’t have a stud finder, you can always use a magnet instead. Then, based on the stud’s location inside the wall, use your pencil to mark where the screws to hold up the TV bracket should go, and where your bracket should attach to the stud beneath the wall. After you’ve located and marked where you’ll want the bracket to go, use the drill to pre-drill the holes into the stud. When these screws go in, they should feel solid and stable, another indication that your TV will be installed securely, without damaging the wall whatsoever. 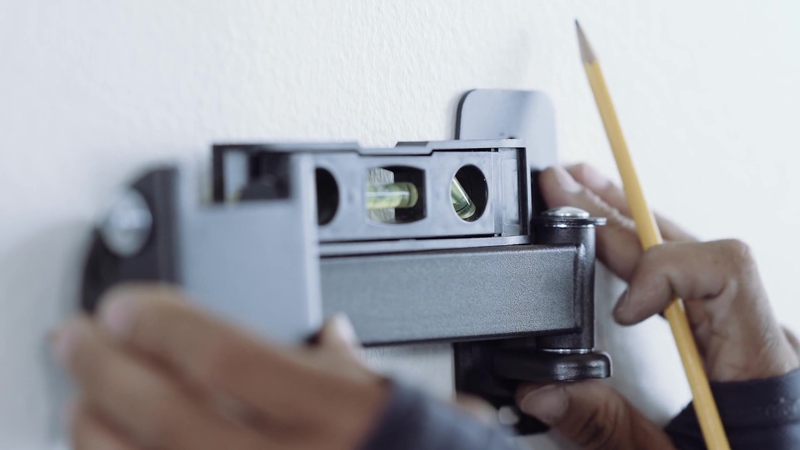 You should also use a leveler to make sure that the bracket is even, and level with the ground, so that your TV won’t look crooked once it’s installed. 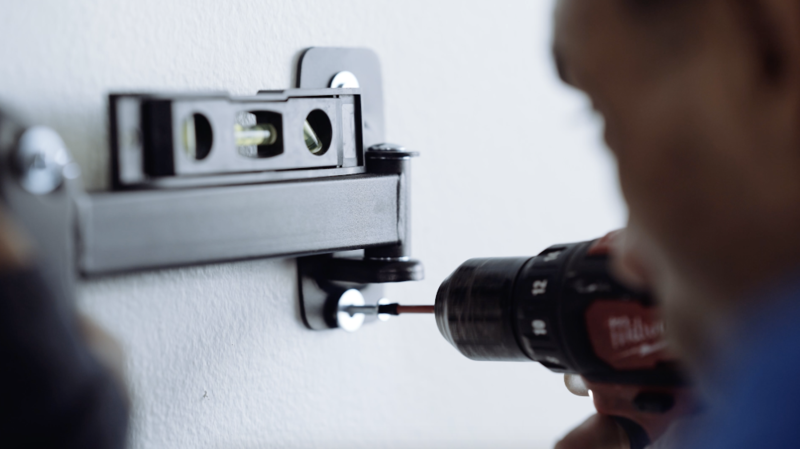 Once you have the holes ready, hold the bracket against the wall, and drill the screws in tightly, so that they hold in place. Now that you’ve installed the bracket onto the wall, you’ll need to carefully lift the TV and place it onto the bracket. Don’t be afraid to ask for help, if necessary, especially if you have a heavy TV - we’d recommend having 2 people lift TVs that are 60” and above. Then, screw the mount onto the back of the TV with the screws and screwdriver, to ensure that it’s secure. Depending on the type of mount, there may be a few places to tighten and adjust the screws before you’re finished, so check them all to be sure. Once you’re done, take a step back and make sure that the TV looks as secure and even as possible. Because you’ve taken all the proper precautions and used a mount and stud that will support your TV’s full weight, you’ll be good to go with that beautifully installed TV, completely damage-free. Some things just aren’t worth the risk. Whether you’re not the most DIY savvy or you simply prefer to not risk potential costly errors, there’s no harm in leaving it to the pros. 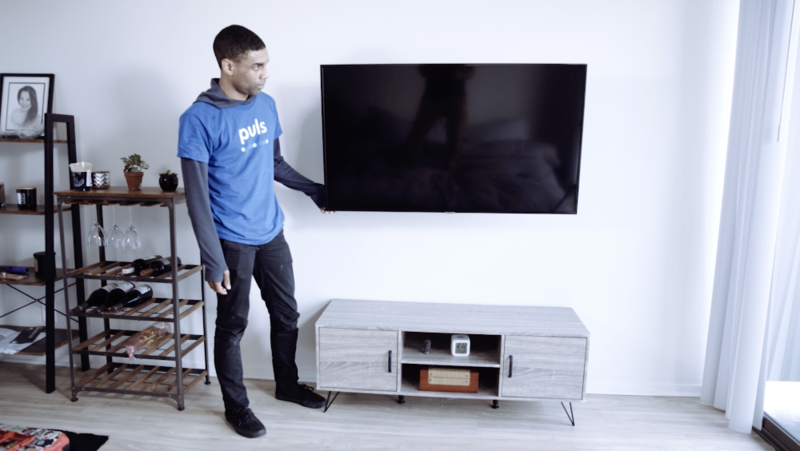 For professional installation that works around your busy schedule, Puls is here to make it easy. Our skilled TV install experts will come to you during the time that best suits your busy schedule, including weekends, evenings and holidays. We’ll do all the measuring, drilling and heavy lifting for you, and we can even hide the wires, hook up your surround, install shelves and much more. Book a service with our experts today, and your TV could be professionally installed by as soon as tonight - you’ll be glad you did. Click here for 5% off your first service with us.